Logan James started an internship at Black Knight Financial Services in 2007 as an undergraduate studying finance and management. Having finished his MBA at JU in 2009, he’s now Vice President and Manager of one of the Jacksonville company’s customer support divisions. Duncan Graham of Scotland moved to Jacksonville in 2003 for personal and professional growth. He graduated from JU in 2015 with an EMBA in Leadership Development, and he is now a Vice President at Black Knight, where he helps guide JU interns. Lindsey Craft first heard about Black Knight at a Beta Gamma Sigma induction ceremony in spring 2015 while a graduate assistant for the JU Dolphins volleyball team. She received her MBA in August 2015 and started the same month as an analyst in Business Performance Management at the Jacksonville-based company. They represent just a few of the many students and alumni who have taken part in JU’s strategic partnership with Black Knight – some as interns and others as Black Knight managers who are now mentoring students after having furthered their own executive training at JU. This organic relationship between the mentors and the students is setting a new standard at the University for collaboration and resource exchanges, and the efforts are yielding cross-trained, high-performing graduates all the way up to top management levels for Black Knight. Since partnering with the University a decade ago, Black Knight has seen dozens of JU students come through its doors as interns, and it has hired many more as permanent employees. Additional Black Knight employees have augmented their educations at JU to help accelerate their careers, and many give back to JU by guiding new interns. 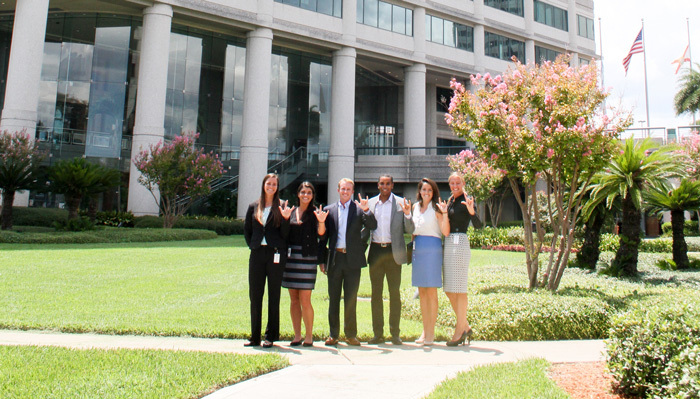 Currently, Black Knight employs 46 JU alumni – many holding Davis College of Business EMBAs or MBAs – and another group of eight JU students are interning there. Much of the success in developing interns into hires and current employees into rising stars has to do with JU’s and Black Knight’s joint move in recent years to strengthen interdisciplinary education efforts. “The students have had a unique education that not only prepares them academically for the workplace, but also to be excellent corporate citizens,” Graham says. What began with Black Knight Chief of Staff Capt. Tom Peterson reading a local news article about oyster beds and drones led to his inspiration to further the conversation with JU – to expand what the two had already been doing with traditional internships. The original relationship pre-dated Business Dean Dr. Don Capener, who joined JU in 2012. Capt. Peterson wanted to take things to a new level and include true interdisciplinary collaboration among students studying business, math and computer science – all core skill areas preferred by Black Knight. The financial services giant specializes in delivering solutions by leveraging decades of expertise and leadership across the mortgage and financial services industry, particularly in mortgages, real estate, technology, government, lending, and capital markets. Capt. Peterson, a 2006 JU EMBA graduate and 2016 Distinguished Alumni, is a 25-year veteran of the U.S. Navy Reserves. He had read that commercial oyster harvesting in the Jacksonville area came to an abrupt halt about 15 years ago because of serious concerns about oyster reef ecosystems, and that JU was doing something about it. After learning what that project looked like in terms of student involvement, collaboration and innovation, Peterson was reminded of the teamwork atmosphere he’d seen first during his military career and since. The oyster bed project is part of Collaborate JU, which began in 2014 and turned out to be the catalyst Capt. Peterson was seeking when it came to mining the University for the mobile and versatile talent needed in potential employees. As part of JU’s Florida EPIC (Entrepreneurism, Policy, Innovation and Commerce) Program, Collaborate JU is designed to ensure that academic standards meet workforce needs by addressing skills gaps that persist nationwide. Too often, as EPIC Director Terri Davlantes said, graduates and employers have varying expectations of one another that may or may not be met. EPIC works to bridge this gap. A 2015 survey by the Association of American Colleges and Universities found a large disparity between how employers perceive a graduate’s career readiness compared to how students and universities do. Employers across the nation cited areas that are most wanting of improvement, which are critical thinking, creativity, communication skills and collaborative strength. Those are precisely the skills Collaborate JU is honing. In the oyster bed project, for example, JU’s Marine Science Research Institute, School of Aviation and Department of Geography and the Environment have joined forces with local agencies in the hope that Northeast Florida’s commercial oyster harvesting beds can be re-opened. But the project doesn’t just benefit Florida’s economic development; it involves JU students in three-dimensional mapping and geographical information technology as well as in using unmanned aircraft and marine research collaboration in ways never before considered. These types of synergetic efforts are what Capener describes as a “petri dish” that is producing a new species of graduate: someone comfortable with crossing the silo lines, having greater mobility and exercising multifaceted expertise. Shrinking skills gaps like those identified in the AACU study, such as in critical thinking and collaboration, is what Black Knight’s human resource department and its top-level executives and other talent seekers are addressing when working with JU. The effort isn’t just happening at the company’s Riverside location. It’s also taking place in the training experiences Black Knight is proactively bringing to the JU campus. For example, in the data analytics industry, experience with a widely known business intelligence software called Tableau is often critical. But new recruits were increasingly lacking efficiency in working with it, with most having never heard of it. Black Knight identified this need and took steps to remedy the lack of practical knowledge by hosting a two-part, in-depth seminar dealing with Tableau for students on campus. 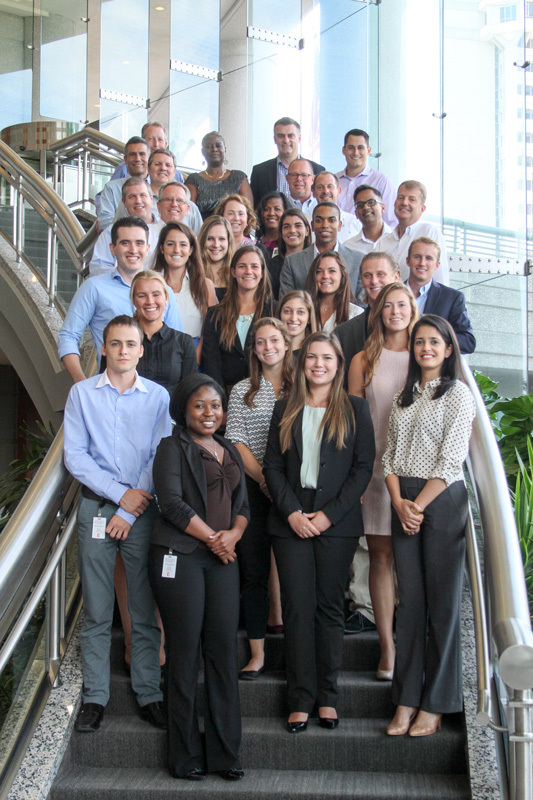 Meanwhile, at Black Knight’s on-site internships, JU students are actively collaborating with the Data and Analytics division, which provides valuable insight to clients. Using the leading mortgage performance software, Black Knight helps customers make more informed decisions through collection, management and linking of data across various platforms, company representatives said. At the same time, clients are being safeguarded, JU interns are being schooled in providing intelligent, accurate analytics and predictive modeling, and they leave better armed for future troubleshooting, according to the company. The success of the Black Knight partnership with JU is portrayed in “real time, real numbers, real experience,” said Brig. General (ret) Mike Fleming, Senior Vice President for University Relations and Development. In fact, it’s been so successful that the University’s staff and faculty are working to gather enough evidence of outcomes and best practices so that the program can be replicated. Fleming describes the University’s growing relationship with Black Knight as a way for students to discover innovative possibilities. This marriage is symbolic of new directions JU has taken in terms of its corporate relationships, which involves giving students the preparation and experience JU’s partners seek as they promote students from being interns to new recruits, he said. The ever-widening relationship with Black Knight manifests at JU at many points: business programs, athletics, veteran relations, career services, corporate funding and other areas. “The great thing is, we’re nimble,” said Fleming, explaining that the flexibility and openness among top execs, college deans, faculty, University administration and students, which helps to create a culture rather than just a contact. Toni Higgs, Director of JU’s Career Resource Center, is managing the effort with Black Knight, corralling the many “asks” that tend to accumulate, while keeping a finger on the pulse of the relationship. Dr. Robert Boylan, professor of accounting with DCOB, who is helping shape and shepherd the effort to define and audit the relationship with Black Knight, likens the process to what any good firm does when profiling and understanding customers: they create a comprehensive reference that contains contacts, requests, preferences, parameters, services rendered, checklists, and the like. Boylan refers to it as core information that is useful in organizing the various aspects of the Black Knight alliance. “If we can improve the metrics … We can hopefully help ourselves make better decisions” about what works best in programs to prepare students for the job market, Boylan said. Higgs said many new opportunities are being offered to students because of the Black Knight joint effort with JU. She uses her experience from a 30-year career in financial services to provide guidance and a dose of reality to students when it comes to pursuing career paths. For Black Knight interns and JU students in general, the goal is to equip them earlier on in the process, to increase informed decision-making. Higgs’ corporate background and perspective is an asset for closing skills gaps, educating parents and students, and even helping some avoid the angst involved in switching majors midstream. Fleming and Higgs work closely to ensure the success of JU students on multiple levels. Fleming says they’ll continue pressing forward until the Career Resource Center “becomes part of the DNA” of students. Higgs has created and fine-tuned her own bit of innovation called Career Track, a comprehensive tool that creates a customized, personal plan for students to achieve preset goals year by year during their education, and prepares them for their eventual job search and employment. The goal is to drive students toward their best fit and then assist them with establishing themselves in their chosen career path. New students are now introduced to Career Track and the Career Resource Center during orientation, and faculty members are able to promote the benefits of both in the classroom. Soon, a Career Track mobile app will be available for download. In addition to Lindsey Craft, Duncan Graham, Logan James and Capt. 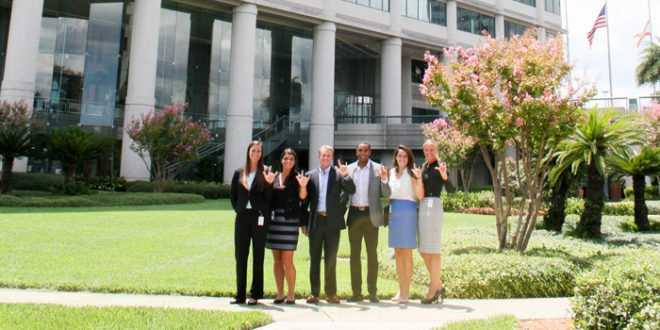 Tom Peterson, other JU undergraduate and graduate students have gone on to succeed at Black Knight, and this partnership has produced a steady stream of graduates who are well-prepared to grow with the financial services company. Examples include Joseph Nackashi (EMBA ’07), President of the Servicing Technologies Division; Shelley Leonard (EMBA ’08), Executive Vice President of Product Strategy; and Bryan Hipsher (BBA ’05 & MBA ’07), Senior Vice President of Finance. Graham, though having never been in the role of an intern himself, did take part in a rigorous interview process with Black Knight. He lists what he calls “core attributes” when it comes to successfully moving into employment with the company. Among these are attitude, work ethic, handling tight timelines, confidence, camaraderie, high-quality output and grit. Craft said she’s heard great feedback about JU interns at Black Knight. She continues to assist with the interview and referral process, as well as planning events that bring together Black Knight employees with JU faculty and alumni. In fact, her direct supervisor, Monica Peck, is also a Jacksonville University alumna. James, meanwhile, is heavily involved in the internship program and now manages Peyton Dole, a JU MBA student. As for Graham, he attends JU job fairs, one among his many other responsibilities, and has come to appreciate the infectious enthusiasm and talent the University’s students have brought to the Black Knight team and all those who interact with them.